Mission: Our Mission is to provide professional development opportunities for our members and to be advocates for our profession. Purpose: The purpose of this strategic plan is to insure that this Association will remain relevant to health and physical educators in Wisconsin. Strategic Partners: Our strategic partners include the Wisconsin Department of Public Instruction, the University of Wisconsin, La Crosse, the American Heart Association, and SHAPE America. Strategic Goals: There are 3 Strategic Goals that if achieved will insure the continued relevance and vibrancy of this Association. Provide quality professional development opportunities. Increase (Improve) our advocacy efforts. Recruit and retain dedicated professionals into our membership rolls. Continue to offer an annual convention of the highest quality and relevant topics for health educators, physical educators, and future professionals. This can best be measured with after action reports and satisfaction surveys. The people responsible for the success of the convention are the members of the convention planning committee which includes all of our Board members. The second indicator of the convention’s success is the attendance. A 5% increase in attendance each year is achievable but will be challenged by the reality of school district calendars that now require many of our members to use personal time to attend. Continue to support two significant DPI sponsored events, Building the Heart of Healthy Schools and the Best Practices in Health and Physical Education. The first and easiest indicator of success is a WHPE budget line item that financially supports these two events. Another indicator of the success of this partnership with DPI is the number of professionals who become WHPE members. Offer at least one relevant workshop in the spring semester of each year. This is a relatively new approach to professional development replacing the district workshops of the past. Provide adequate training and mentoring for both new and experienced Board members. This can be accomplished at our annual convention as well as the first regularly scheduled board meeting. Additionally, personal visits to Board members by the WHPE CEO and/or the WHPE President should take place at least once a year. This is easily measured and the progress should be recorded in the minutes of each Board meeting. One indicator of success has already been met, the addition of a registered lobbyist. This allows WHPE to actively coordinate any visits to the Capitol without restricting the number of visits per year. The lobbyist can also meet with lobbyists from other organizations as a peer. The lobbyist should prepare a formal report for each Board meeting and keep the board informed of any legislation affecting our profession on a timely basis. It will be the responsibility of the Board to evaluate the success of the lobbyist. Facilitate on-site visits to health education classrooms and gymnasium for elected officials. This requires our members to understand the value of a “home field advantage” when advocating for our profession. A measurable success indicator would be to have at least 50% of all state senators visit a health education classroom or gymnasium each school year. A second indicator would be to have each of our Board members invite at least one local school board member into their class room in the first semester of the school year. These indicators should also be recorded in the minutes of each Board meeting. The CEO/Lobbyist should provide any support necessary for success. Additionally, on an as needed basis, the WHPE lobbyist should be prepared to mentor any member who is uncomfortable visiting the Capitol. Continue to purchase a booth at the WASB convention and staff the booth with two people who can tell the WHPE story. Success indicators would include the number of school board members and administrators that we engage in meaningful dialog. We should budget for a small gift with our logo. An after action report should be prepared for the WHPE Board of Directors. We should always invite a representative from the American Heart Association to join us at this booth. The first indicator of success should be growth. 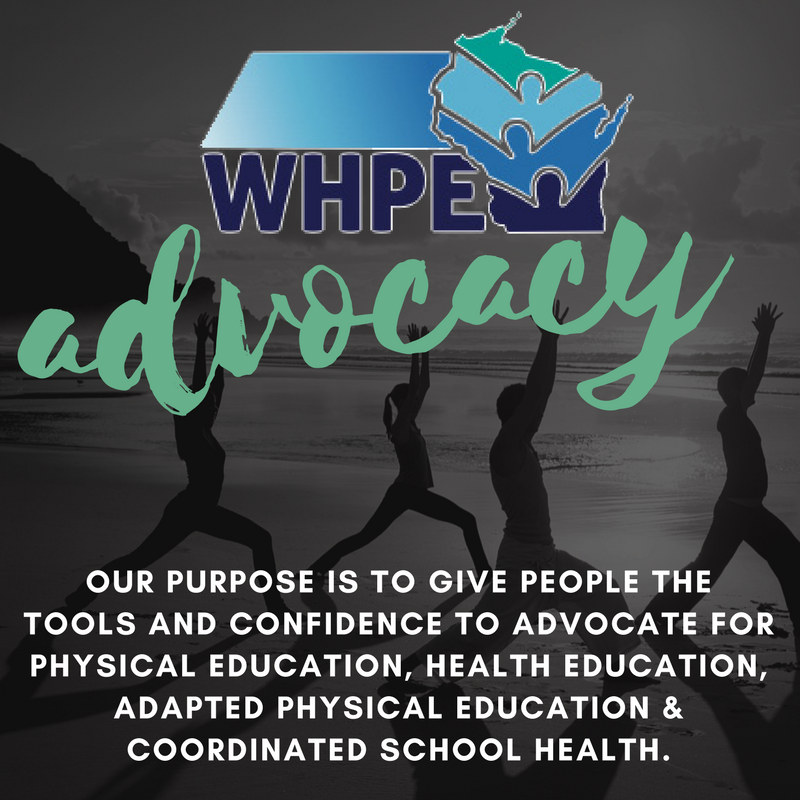 We should establish a goal of growing by 5% each year until 50% of all health and physical educators in Wisconsin are members of WHPE. We need a formal “On Boarding” process. When a new person joins our Association, we do little if anything to bring them on board and make them feel welcome. This is an area where we have a lot of room for improvement. A welcome packet should be prepared that includes our latest newsletter, letter from the president or CEO and a brief questionnaire asking them if and where they would like to volunteer. The actual recruiting of new member is best performed by other members. It is imperative that all of our members can articulate the benefits of membership to their colleagues. This WHPE strategic plan should be reviewed and updated annually.